The annual Conservative Political Action Conference begins this week, a three-day event hosted by the American Conservative Union where activists, officeholders, campaign consultants and others will hear from a dozen or so potential Republican presidential candidates – among them Jeb Bush, Scott Walker, Rand Paul, Chris Christie and Ted Cruz. Last year’s series of Pew Research Center reports on political polarization used a 10-item scale of ideological consistency to place Americans into five categories: consistently conservative or liberal, mostly conservative or liberal, and mixed. By that metric, 9% of the public overall is consistently conservative, including 20% of Republicans and Republican leaners; most of the remaining Republicans and leaners were “mostly conservative” (33%) or had a mixture of liberal and conservative views (37%). 1Consistent conservatives participate in politics at higher rates than most other ideological groups. 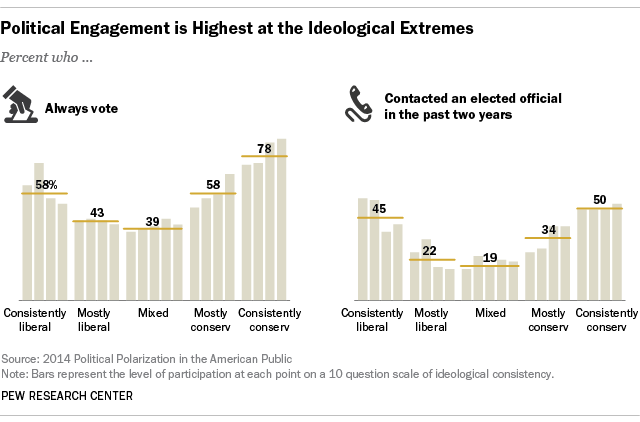 Political engagement tends to be highest among the most consistent conservatives and liberals, the Pew Research survey found. Half of consistent conservatives, for example, said they had contacted an elected official within the past two years – the highest level of any of our five groups. (The corresponding figure for all Americans, by the way, was 28%.) Consistent conservatives also ranked high on other measurements of political engagement, such as donating money (26%), attending campaign events (24%) and volunteering on a campaign (12%). 2Conservatives had outsize influence in the November midterm elections. Although consistent conservatives make up only about 9% of the total adult population, they vote at higher rates than people elsewhere on the ideological spectrum: 78% said they always vote, compared with 49% of the general public. Consequently, a report we published a few weeks before the 2014 midterms estimated that consistent conservatives would make up 17% of the November 2014 electorate. 3Conservatives would rather live in small towns or rural areas than anywhere else. Our research found an overwhelming preference among the most conservative Americans for nonurban lifestyles: 41% of consistent conservatives said they would live in a rural area if they could live anywhere in the U.S., and 35% picked a small town; just 4% said they’d prefer a city. 4When it comes to raising children, conservatives prioritize responsibility, faith and hard work. When we asked our American Trends Panel about the three most important traits to teach children, 61% of consistent conservatives cited “being responsible,” and about as many (59%) identified religious faith as particularly important; hard work was chosen by 44%. While responsibility led among all five ideological groups, and hard work was among the top three for all but consistent liberals, religious faith was chosen by significantly more consistent conservatives than all other groups. 5Conservatives gravitate toward Fox News. 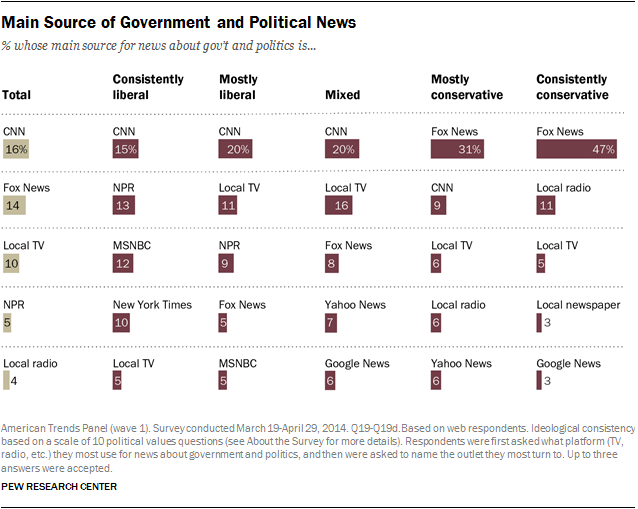 A separate Pew Research report on polarization and media habits found that 47% of consistent conservatives (and 31% of people with mostly conservative views) cited Fox News as their main source for news about government and politics; no other news source came close. And 88% of consistent conservatives said they trusted Fox News – by far the highest level of trust by any ideological group of any single news source among the 36 we asked about.